1870, pear wood, sharkskin and brass wire inlay, iron fittings, Kangwha Island, Kyung Ki Do Province. 23.75″w, 10.5″d, 12.5″h. This is a box found on a political prison colony after the Japanese Occupation by a missionary doctor who went there to treat the sick and dying. Furniture was not treasured by the elite class or the government at that era, so for his work, he was allowed to take anything the prisoners left behind. 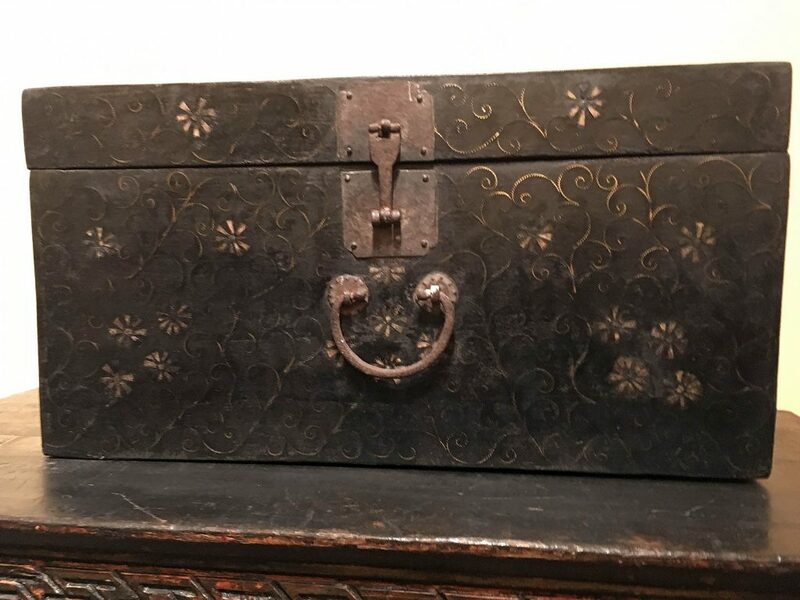 This box is so beautifully decorated with inlays of rare sharkskin and thin reverse brass wire that it has to have belonged to a member of an elite family who was in disfavor with the Court and sent into exile. It is a wedding box once containing the bride’s wedding gifts and treasured personal items. This relic has hand-made iron fittings that became rusted with age and shows a wonderful patina of old age. It was certified as rare by a Professor of Korean History and Antiquity, one of only thirteen certifiers approved by the Korean government in the 1900s.